As Jobjoris and I decreed last week, the theme for today’s Teutonic Tuesday is the lovely (and frightening) Porsche 917. Let’s see em! And here are all the ones I have, including a custom I just finished a few days ago for a friend on Instagram. He hasn’t seen it yet as it’s in the mail right now, so shhhhh don’t tell him! Tube frame flat-12 engine, the driver’s feet pretty much on top of the front axle, what’s not to love? The custom started out as the Porsche series car, but I cut open the engine cover and made a hinge to show off the (admittedly not very finely detailed but still) glorious flat-12. I also fully detailed the cockpit, gave it new wheels (staggered minilites) and painted the inside of the headlights to show them off a little more. I also cut the filler plastic out of the rear chassis parts so it looks more realistic. I had some issues when I clearcoated it. The solvent in the clearcoat spray can melted the numbers I had carefully painted onto the meatball decals so I fixed them as best I could but I’m not 100% happy anymore. :( Next time I’m taking the time to do number decals. I just didn’t have any laying around... It’s still one of my favorite customs to date, though! 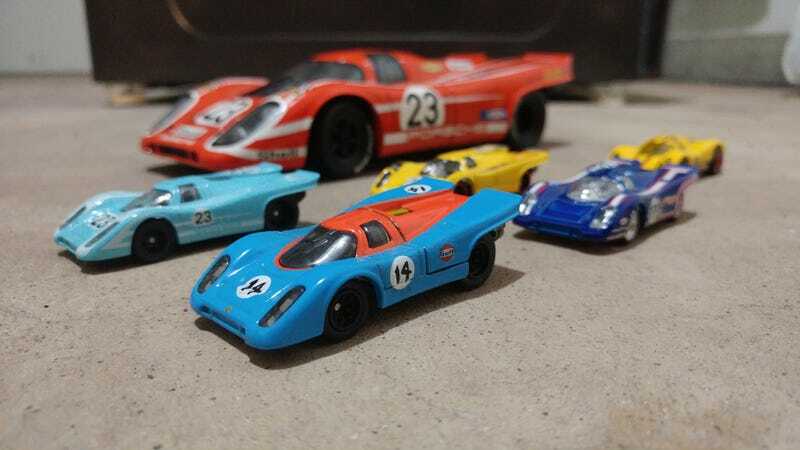 The other opening casting is the Hot Wheels Hot Ones version of the original 1970 Porsche 917 casting. A very nice casting in its own right!